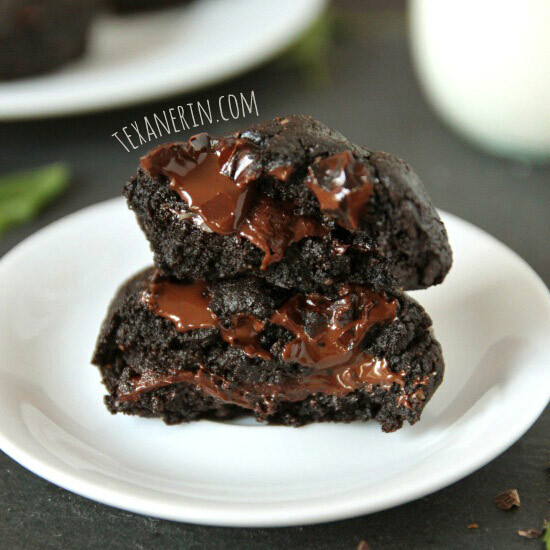 These grain-free, gluten-free and 100% whole grain mint chocolate brownies are ultra fudgy, minty, and easy to make! For my most recent post on My Baking Addiction, I made these gluten-free mint chocolate chip brownies. Posting a grain-free recipe that’s also 100% whole grain was actually a first for me. I often post recipes with oats or oat flour that are gluten-free and whole grain, but when I do grain-free baking, I normally use nut flours. Buckwheat was one of the flours I used in the book and I experimented with it in so many heavily spiced things like carrot cake, spice cake, and gingerbread. My thinking was that a few tablespoons of spices could make me like buckwheat but I was wrong. Of the gluten-free ancient grains I used in the book (quinoa flour, teff, and buckwheat), this one was definitely my favorite because you can use it almost like whole wheat flour. By the way, I’ve made this recipe with whole wheat flour several times and it works! So there’s no need to go out and buy buckwheat, unless you want to try something new. These mint chocolate brownies are super fudgy as long as you don’t overbake them, which is easy if you’re on the cautious side. There’s really no good way to test them other than digging into one of the corners, which I always do anyway once I pull a tray of brownies out of the oven. ;) The toothpick testing method just doesn’t work here. In a large mixing bowl, stir together the melted butter or coconut oil, sugar, and vanilla and peppermint extracts. Once combined, add the eggs one at a time, and stir just until combined. Add the dry mixture to the wet and stir just until almost no streaks of flour remain. Do not overmix! Fold in 1 cup chocolate chips. Pour the batter into the prepared pan and bake for 16-20 minutes or until the brownies have formed a thin crust and appear set in the middle. A toothpick inserted into the center or sides will come out wet. The brownies will continue to bake as they sit in the pan and will firm up as they cool. Sprinkle 1/4 cup additional chocolate chips on top, if desired. Let cool completely and then cover and store at room temperature for up to 4 days. You must use buckwheat and not whole wheat for a grain-free / gluten-free version. For a dairy-free version, use coconut oil. I prefer to use refined coconut oil, which has no coconut taste or smell. If you use unrefined coconut oil, these will likely have some coconut flavor to them. 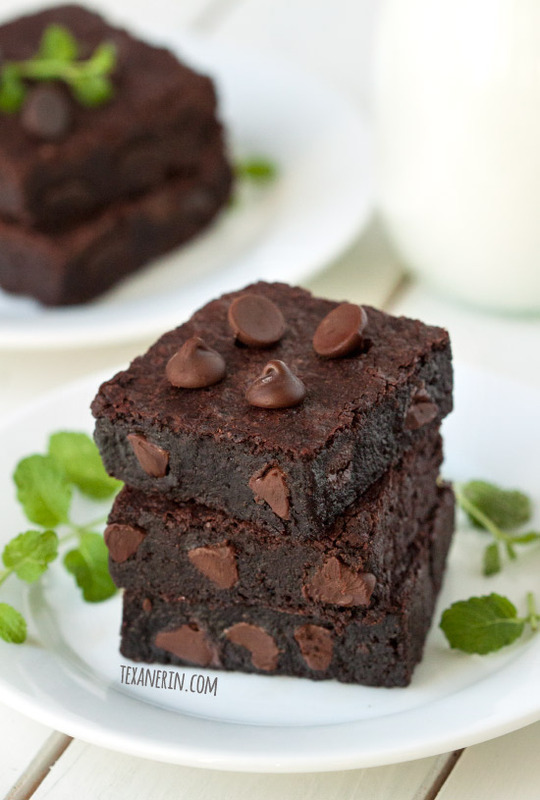 35 comments on “Mint Chocolate Brownies (grain-free, gluten-free, dairy-free)” — Add one! How are these grain free or gluten free? earthy means dirt to me too haha. 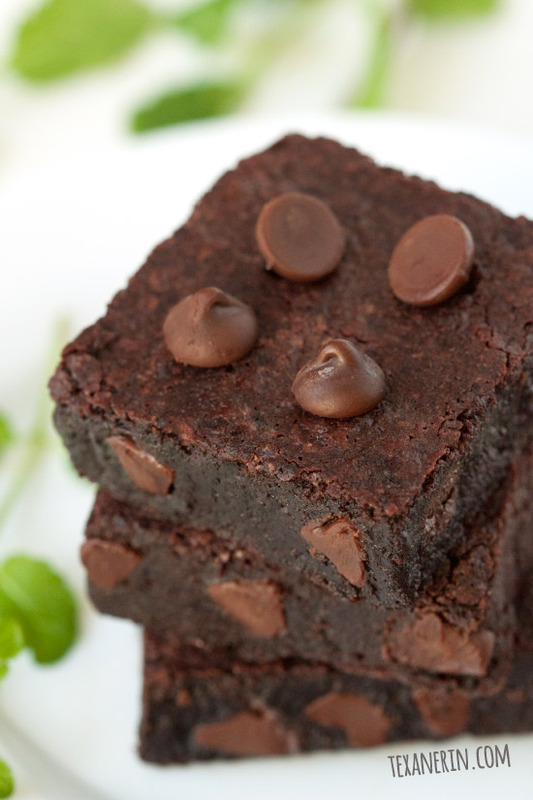 I love fudgy brownies and think that those are the only kind that should ever be made! Love these! Haha “it tastes like dirt.” I once made a beet green pesto that I called “earthy” and my husband politely ate it but later told me it tasted like dirt and I never had to make it again…haha. I really loved the addition of buckwheat in my cake I made and I love it in these brownies. They look totally ooey and gooey and I want a giant plate! I absolutely adore buckwheat flour. I can’t wait to try these brownies! I haven’t even heard of buckwheat flour but I will definitely be giving these a try with whole wheat! They look great! I have yet to try buckwheat! I’ve been focusing on no-bake treats but once I’ll hop on the buckwheat train, I’ll be trying these brownies – yum! Before testing your recipes for your book I never would have believed that cocoa powder could so successfully cover up the taste of buckwheat flour (which tastes like grass mixed with gym socks otherwise). But you long ago made a convert out of me and I am going to make these this weekend! These look fudgy and irresistible – I love that they’re studded with chocolate chips, too! Why oh why are you not my neighbor! My clients are always asking me for sweet treats like your brownies made with alternative flours. I will put these on my “Nik Snacks Approved” list of items! I brought McCormick over here with me from the US. :( Sorry about that! You can make your own but it won’t be ready in time for Christmas. You just need mint leaves and vodka! Mr. T saw your comment, was interested, and found these. It’s a little late but I hope they help! Perfect for the holidays, but I’d eat these beauties any day of the week/month/year!!! I’ve never baked with buckwheat flour – but these look delicious! I need to get my hands on some buckwheat flour! These look ah-mazing. I agree about the buckwheat flour tasty very “earthy” or well….dirty lol! I’ve used it once in a banana bread but the other half was with gluten free flour blend and with the fruit in there i was really good. I bet with cocoa powder to mask the flavor it’s awesome! It looks awesome anyway! Thanks, Brenda! And I found buckwheat to be fine when it was mixed in with another flour but 100% buckwheat without cocoa powder makes me gag! Bla. Straight into the trash!